The Benjamin Upper School Athletic Complex | JTR Inc. 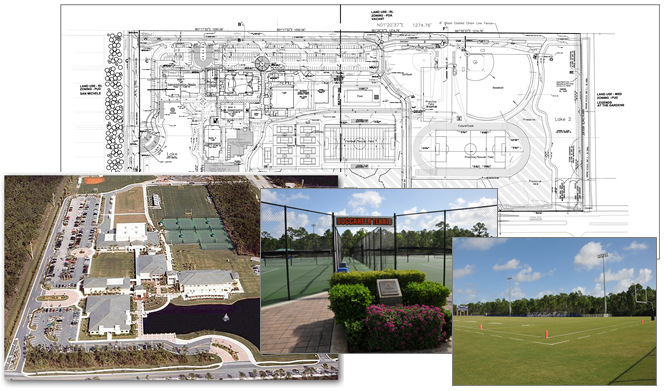 The Benjamin Upper School Sports Complex, Palm Beach Gardens – A 50-acre site with 10.29-acres of open space and a 15.75-acre athletic complex designed to be a multi-seasonal, multipurpose facility suitable to serve 50+ middle and upper school sports teams. The complex provides training areas for student athletes to excel at football, soccer, softball, track and field, tennis, basketball, lacrosse, competitive cheer, volleyball, and wrestling. The Benjamin School also hosts annual Florida High School State Athletic Association competitions for regional, Class A events in volleyball, soccer, softball, basketball, and track & field. State-of-the-art field lighting system to prevent light pollution and offsite impacts through use of Dark Sky lighting and a remote light monitoring system.